My friend mentioned the other day that she was looking for a copper light fitting for her living room, I knew I’d seen a nice one but couldn’t remember where. Then I found all these beauties. I’m hankering after them now. This curvy Copper Shade was the light I had in mind, designed by Tom Dixon and available from The Lollipop Shoppe at £340. The Void Light also by Tom Dixon is a bit softer and I suspect gives a cosier light, topical too as it was designed with Olympic medals in mind. This one is £310. 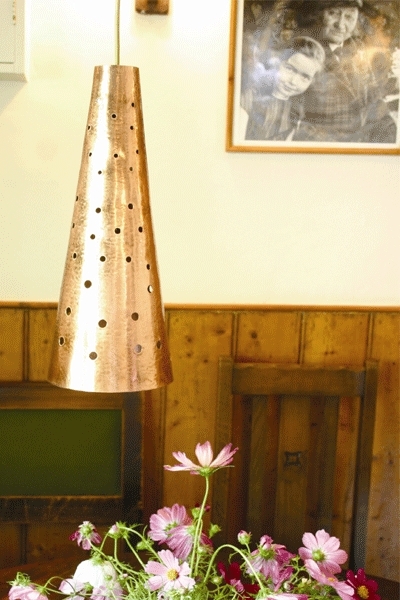 This suspended perforated copper lamp has more of a rustic style and the perforations would give a lovely effect on the walls. It’s £154 from The French House and they also have a similar wall lamp. Innermost’s Bubble LED Spot Pendant is really stunning and designed to look like an earring, the cheapest I’ve seen it at just under £285 is at Lighting Styles in four finishes. But Innermost have three more versions where they have combined different colour bubbles on the same pendant if you’re after something a bit bolder. More traditional is this hammered finish copper pendant light by Country Living for £84, I think it would look great hanging low over a dining table. Yes these are for outside, but consider your garden as another room for a moment and imagine a couple of these Globe oil burning torches round the patio. If we get a freezing summer you could huddle round them for warmth. You can get one from The London Garden Trading Company for £35. They also do a cylinder version that is more of an Olympic torch shape.